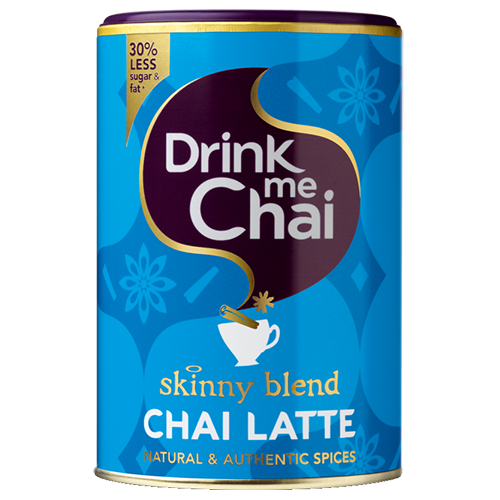 Drink Me Chai Latte Skinny Blend is an aromatic and sweet blend of tea, milk and warming spices. The blend has had sugar and fat content reduced by 30%. Drink Me produces a wide range of delicious and diverse Chai Latte, which is inspired by the original Chai from India dating back 5000 years! How to prepare hot Chai Latte: 3 teaspoons of Chai Latte + a cup of hot water + mix it all = delicious and warming beverage! For a creamier texture, add hot frothed milk instead of a half of the hot water. How to prepare cold Chai Latte: Pour 4 teaspoons of Chai Latte into a blender + add 300ml of cold milk with ice + blend for approx. 20 seconds = Delicious and refreshing drink!